On Sunday, 07 October 2012, at approximately 5.30pm, Israel’s forces launched 2 missiles targeting 2 men on a motorbike as they were passing by Taha Hussain Elementary School in the Al-Brazil neighborhood of Rafah, in the southern Gaza Strip. Subsequently, 1 of the targeted men died of shrapnel wounds, while the other had one of his legs amputated, according to medical sources. 8 civilian bystanders, including 4 children and 1 woman, were also wounded in the attack. Israel’s forces often use airstrikes for extra judicial execution of suspected members of armed groups in densely-populated areas of the Gaza Strip. 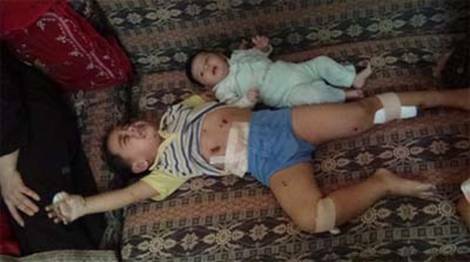 Israel refers to these as ‘targeted killings’. However, on many occasions such attacks also injure and kill civilians who are in the vicinity of the target. 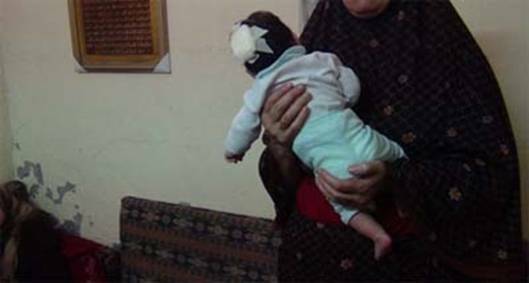 Sabrin Al-Maqousi (23), and her 2 children, Bisan (1 month) and Nassim (2), were wounded in the attack. Her cousin, Jehad Al-Qatrous (27), was also wounded in the same attack.